So after 61 games in the football championship, it comes down to the biggest game of the year in the Gaelic Football calendar at GAA headquarters at Croke Park. Dublin will meet Mayo for the second successive year in the final and they will be bidding for their third Sam Maguire Cup in a row and their 27th All-Ireland title overall. Mayo on the other hand will be bidding for their fourth All-Ireland title and their first since the mid 1950’s. The game will be the 15th meeting of both sides in championship football, Dublin have won the last 8 out 14 games between the sides, with Mayo winning two and 4 draws. Indeed, the most recent draw was in last year’s All-Ireland Final, before Dublin were victorious in the replay. An interesting statistic going into this game is that it will only be Dublin’s sixth game in the championship this year, compared to Mayo’s tenth. What can we expect to see in the game? Both sides have been putting up high scores in recent games; Dublin have averaged 2-21 in their six championship games to date, while Stephen Rochford’s Mayo has averaged 1-19, which is incredible scoring from both sides in fairness. Mayo will need to stop Dublin’s running game, as well as keeping an eye on the system they have used in recent games where they drag the defenders out to the wings, keep the pitch wide and leave space in the inside forward line. If there is a weakness in the Dublin team it is in the full back line especially if a high ball comes in around the square, they haven’t really been tested this year and if Mayo were to put Aidan O’Shea in at the edge of the square to test them on this who knows what could happen. Andy Moran has a revelation this summer, he has been Mayo’s best player without doubt. He is surely in the reckoning for footballer of the year at this stage. However, if Mayo are to win this they will need more from play, from the likes of Cillian O’Connor, Jason Doherty, Diarmuid O’Connor and Kevin McLoughlin. They have a solid defence with Colm Boyle, Lee Keegan and Keith Higgins all having superb years to date. Jim Gavin’s Dublin will come into the game somewhat untested after they put Tyrone to the sword in the semi-final by 12 points. However, this will be a different game. Tyrone sat back and let Dublin power through their defence, Colm Boyle and Co won’t let this happen. They are a tight marking defence, Higgins plays a sweeper role and I can see him doing this again this coming Sunday. However, Jim Gavin will not about sweepers and he will focus on his own side’s strengths which is running with the ball at pace. Jack McCaffrey, James McCarthy and Con O’Callaghan are players that can do this with ease. Dean Rock has come into his own this year and has started contributing more scores from play which is what Gavin would require. It says a lot about how well he is regarded when the likes of Bernard Brogan, Kevin McMenamon and Paul Flynn are on the substitute’s bench. That is the thing though, I feel Dublin have a lot stronger bench than Mayo. The question many are asking is will Diarmuid Connolly start? My answer would be to them, why start him when they have been playing so well anyway. He would be great to come in the last 10 minutes along with Bernard Brogan and Kevin McMenamon. Mayo do not have the same options as Dublin so this could tip the scale in terms of winning the game in Dublin’s favour. Whatever happens on Sunday it has been a great year for Gaelic Football. There has been some good games, however some will argue that Dublin are still the dominant force and I guess we will know how dominant they are if they brush aside Mayo at the weekend. I expect Dublin to win this, but Mayo will put up a massive fight and they will not be beaten until the final whistle. Just remember last year only for two Mayo own goals last year they would have beaten Dublin, so there is little to separate the sides when you think of it. 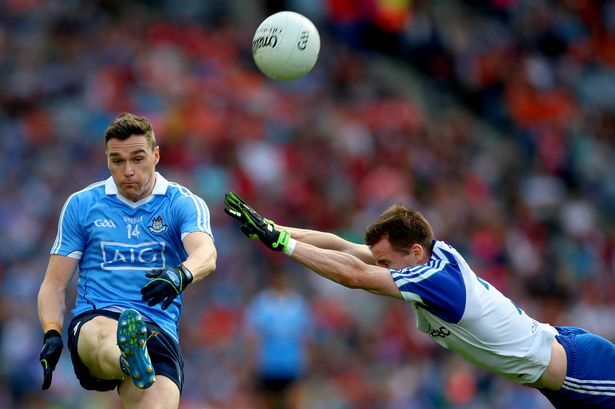 Dublin are favourites at 2/5 to win, Mayo are 3/1 and the draw is 8/1. Dublin to win for me though.